7PM AIR SHOWING // EMERGING ARTIST SPLIT BILL with Lauren Horn and Emma Brown *HELD AT SCDT! 7PM AIR SHOWING with Rythea Lee *HELD AT SCDT! CAMERON MCKINNEY/KIZUNA DANCE (hip hop/Butoh choreographer) Described as “mesmerizing” [The Stewardship Report] and “brilliant” [Huffington Post], Cameron McKinney is a New York City-based choreographer, dancer, educator, and author. He founded Kizuna Dance in 2014 with the mission of creating works that celebrate the Japanese language and culture. His work has been recognized through a Choreographic Fellowship for the Alvin Ailey Foundation’s New Directions Choreography Lab, provided through generous support from the Rockefeller Brothers Foundation. His choreography was awarded the Audience Choice Award at the 2017 Men in Dance Festival in Seattle, WA. LAUREN HORN (SCDT Artist in Residence) is a movement and text-based artist from Windsor, CT. She graduated from Amherst College with degrees in Psychology and Theatre and Dance. Lauren’s work explores identity and the ways it can be uncovered, marginalized, highlighted, and erased. By utilizing movement and text as means of fostering a more welcoming form of vulnerability, the work creates a space for self-reflection and conversation for both the performer and viewer. Another aspect of Lauren’s work is entrenched in creating a dialogue around our current society’s relationship to technology. From the Silent Generation to Generation Z, she wants to understand how groups of individuals, in each living generation, feel that technology has affected their expression of their true self. 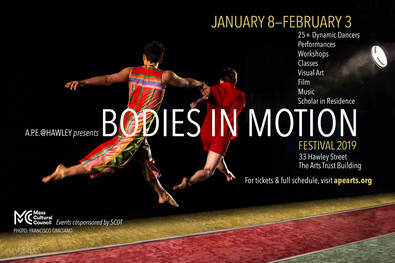 Lauren’s choreographic work has been showcased at The Studio of Contemporary Dance and Thought in Northampton, MA, The Northampton Center for the Arts, Amherst College and ACDFA New England. Lauren has performed with Deborah Goffe’s Scapegoat Garden, Dante Brown’s Warehouse Dance Company, Arien Wilkerson’s TNMOT AZTRO, Wendy Woodson, Katie Martin and Jennifer Nugent. While in the Five College Dance Consortium, Lauren has studied under Paul Matteson, Angie Hauser, Jim Coleman, Shayla Jenkins, Paul Dennis and Caroline Fermin. She has also performed in repertory works of The Bebe Miller Company, Bill T. Jones/ Arnie Zane Company, Delfos Danza Contemporanea and Gallim Dance Company. EMMA ROSE BROWN is a Queens-based performer, multidisciplinary artist, and audio archivist working in the field of dance. She assists in the preservation and production of the Dance Oral History Project at The New York Public Library for the Performing Arts. She is currently a 2018-2019 Fresh Tracks artist at New York Live Arts. This past year she was an artist-in-residence at The School for Contemporary Dance and Thought, The School of Making Thinking, and at the Ridgewood Older Adult Center through the Queens Council on the Arts. Emma has collaborated, improvised, and performed in the work of Julia Gladstone, Diana Crum, Jen Polins, Keely Garfield, Lisa Parra, Tyler Rai, Wally Cardona and Jennifer Lacey, Joanna Kotze, Brooklyn Touring Outfit, K.J. Holmes, Inkyung Lee, and Emily Johnson. As a member of the Ridgewood Tenants Union, Emma works to educate NYC tenants about their rights. Emma holds a BA from Smith College in American Studies and hails from Watertown, Massachusetts. MEREDITH BOVE (New Works/site specific choreography) is a choreographer and writer based in Northampton, Massachusetts. She approaches movement as a practice for experiencing the body as unfixed, mutable, and process-oriented. Currently, she teaches in the Theater and Dance Department at Keene State College, and is Editorial Associate for Contact Quarterly. She holds a BFA from the University of the Arts in Philadelphia, and an MFA from Hollins University in Roanoke, VA.